A Crabwood Creek, Corentyne labourer is feared dead at sea, with family members receiving sketchy reports surrounding his disappearance. According to information received, the 52-year-old Karamchand Parbhudyal called “Dara” on Saturday last ventured out to the Corentyne River with three good friends to fish and return home. But the fishing trip took a sour turn as the three men returned home with news that the laborer was missing. The man’s daughter, Tanuja Parbhudyal, told the media that at about 2:30 pm on Saturday, she receieved a frantic call from her mother who informed her that her father was missing at sea. The younger Parbhudyal stated that she was told by one of the men that they left her father, a strong swimmer, standing five feet away from the shore while they were throwing out the seine. Moments after, they discovered that the man was no where to be seen. “They said they left him stand up in waist height water and that they were reversing the boat and throwing out the seine and when they turn back, he was gone. But what they saying is not making sense to me because my father is a very good swimmer and a diver and I don’t think that it is possible for him to drown in that amount of water”. 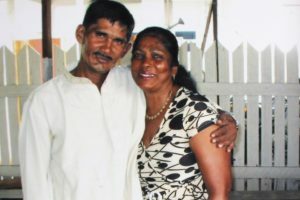 The missing man’s daughter said that her father was wearing a pair of brown pants a black T-shirt and white hat at the time of his disappearance but only the hat was recovered. She stressed that family members immediately contacted the police and formed a search party but they have since come up empty handed. “My husband and his uncle went out the Saturday night when the water was low to the spot where they claim they last saw him and they found no body, nothing. These men know what happened to my father and we are begging them to just say something”. Meanwhile, police have arrested the three men who are assisting with investigations as the search continues.